For these incredibly rare, free-ranging animals, our hunting services conducted on private rangeland have absolutely no equal in West Texas or in much of the world for access to this wild species. These hunts are conducted on a wide variety of valley, canyon, foothill and desert mountain terrain. The higher elevations range up to 6500 feet with rugged rock formations, native grasses, cedar and pinion pines. The lower elevations will include desert foliage such as ocotillo, sagebrush and cacti. Red and Armenian sheep are exceptionally wary and athletic. Originally native to Iran, they were introduced to the Williams Ranch in the late 1970’s with over 90 square miles of habitat, all privately owned and exclusively hunted by Rowdy McBride Hunting Services. These sheep are offered to a limited number of hunters each year, and qualify for the OVIS World Slam. Sportsmen from over the world come to West Texas for this exclusive experience, many of whom are repeat customers. Our hunts are conducted on-foot and can occur on widely varying terrain where hunters will need at least some level of personal mobility and physical conditioning. Our success rate is very near 100% for our hunters obtaining their animals, and every year we help our hunters achieve top categories for free-range trophy quality specimens. Rowdy Mcbride Hunting Services exceeded my expectations. Every detail form the Transportation, lodging,and meals were top notch. 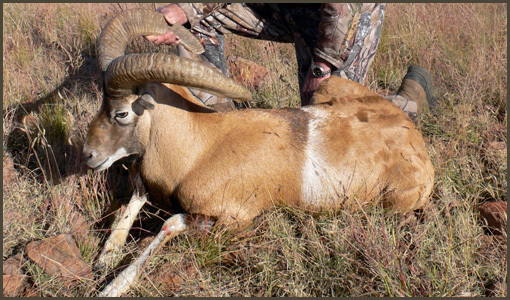 Rowdy could not have been more helpful, patient, and his professionalism helped me collect a great Red, Armenain, and Aoudad rams. Thank you Rowdy and your staff for the amazing experience.